Did I imagine it, or can someone confirm that along Northside drive there is a sign that says something like "A child was killed here by a deer." I seem to remember it is near El Cap, but could be elsewhere. I have not noticed if it is still there but it is/was on the north side of the road just past the intersection of the El Cap Crossover going west. At one time it was a virtual geocache but I can't find it on my list anymore, otherwise I would have been able to give you the coordinates. Edited 1 time(s). Last edit at 10/12/2012 11:28PM by parklover. Probably after some nitwit parent permitted their child to get THIS close to a dear! There is some text if you click on the "INFO" button in the upper right hand corner. The sign is located at N 37 43.476 W 119 38.084. The virtual geocache highlighting this sign is GCHYQ7 and was found recently, so the sign is still there. I had looked at my geocache log trying to find the coordinates, and did not recognize it as the log - "At the nose of El Capitan". I knew that I done that one so when I was going through the descriptions of the caches in the area, the description of that cache seemed different than the one when I did this cache years ago and I did not read all the way down to the end so I missed that it was the one that I was thinking of. Thanks for posting because I was beginning to think I had memory problems. I think of that fatal Yosemite deer encounter often; Cody, Wyoming has a minimum of 300 resident deer in the city limits, and many otherwise functional people think they're cute. I know their potential and keep my distance. Before you crucify nitwit parents, you should read the whole story. The family was having a picnic at Wawona and did not notice the kid wander off toward the deer. The deer was a spike buck, and was not aggressive - it was grazing while the child approached, and when startled, jerked its head up and caught the child under the shoulder in a major artery, causing damage that combined with the long drive to a hospital, killed the child. That's not what the newspapers reported at the time. According to the UPI article, the young five-year-old boy was feeding the deer potato chips. The deer grabbed the bag of chips and the boy tried to get it back. The deer then pinned the boy to the ground and gored him. Edited 3 time(s). Last edit at 10/17/2012 09:20AM by plawrence. The family was having a picnic at Wawona and did not notice the kid wander off toward the deer. The deer was a spike buck, and was not aggressive - it was grazing while the child approached, and when startled, jerked its head up and caught the child under the shoulder in a major artery, causing damage that combined with the long drive to a hospital, killed the child. Full details of the incident can be found in "Off the Wall - Death in Yosemite" (well worth reading, if you have not yet done so), which says the deer was startled and jerked its head up - IOW, not an aggressive attack, just a tragic accident. I suspect the "pinning/goring" was a garbled early story that was disproved at the inquest. The key point is that the kid was just out of sight, so the family didn't realize he was feeding deer. And don't say that a 5-yo should never be out of sight - at that age I was walking over a mile on my own to get to school, like most other kids did in the 60's. Edited 2 time(s). Last edit at 10/17/2012 10:03AM by Royalist. My point wasn't that the deer was agressive, but that deer wasn't just grazing own its on. The boy was feeding the deer potato chips, a big and dangerous no no. The key point is that the kid was just out of sight, so the family didn't realize he was feeding deer. And don't say that a 5-yo should never be out of sight - at that age I was walking over a mile on my own to get to school, like most other kids did in the 60's. I hope you understand that there's a huge difference in letting a young child walk to school alone through familiar streets and neighborhoods versus letting a five-year-old wander off out of sight in forested parkland by a river with wild animals present. What would have happend if the child had tumbled into the south fork of the Merced and drowned instead of being accidentally gored by a buck? Context is everything. There are places in this world where a child of five should be more closely supervised. And Yosemite is one of them. I take all newspaper articles with fifty grains of salt these days. Every article published about any search I've been on has gotten major facts wrong. Whether that is a communication breakdown or what, it remains true. Re: That video is incredible. What ws that dad thinking? The closest that I got to a deer with my kids was about 10 feet away. Of course, every time that I get that close to a deer(especially a buck), I have to tell the deer a joke. Did you know that beer nuts are a buck twenty-five, but deer nuts are under a buck. I do that every time that we are in Yosemite. My kids get a chuckle out of it, the deer only sometimes. Has a bear ever killed anyone in YNP? Not in the park since it became a park. The natives have been there for thousands of years. I'm sure a bear got one of them in the area. I think the American Indians had more bears fatalities in the Yosemite region while grizzly bears still roamed the area. But once the grizzlies were killed off in California, I don't think there hasn't been much of any fatalities anywhere in California caused by the native black bears. The black bears DO CAUSE a lot of property damage though. I am a bit surprised that there are folks on here that think this type of behavior is OK. Whether you be a parent or not, please do not approach or feed the animals!!! I don't think anyone here is condoning it. Or did I miss the post? A desire for accuracy isn't condoning anything. You need to practically KICK squirrels away, and to actively shoo the deer. They walk up to you and beg. Expecting folks with little to no experience with animals to understand that behavior as bad, or parents to scare away animals in front of the kids (kids live in a world where animals talk and are friendly) is a bit insensitive. However - I do just that myself, and anyone who bothers to listen to rangers should do the same, regardless. Teach the kids that it's for the animal's sake. The holy grail for this post would be a photo of the sign. First off, I have a six year old son and we go to Yosemite often. He loves it there and knows the rules. I watch him like a hawk, as every parent should. Also, this forum is for the transfer of knowledge, not for crucifixion, that is for Sundays I also assume that the parents of the kids in the deer feeding video or the bison video are not on this forum, and if they are I want to apologize if what I am saying is offensive. I think what plawrence and I are trying to convey is that the buck needs to stop somewhere. With kids it is literally their parents, which is why they are nitwits for letting their kids pet/feed a deer or go near a bison. So why say something that obvious on a forum like this??? To maybe get the rest of the adults who may witness this activity in a National Park to SPEAK UP!!! Yell something like, "Hey, you don’t want people calling you a nitwit on a forum do you!" Or fill in the blank. In the end, these are wild animals and people should know better. Let's stop looking for excuses in the details and call these people out on their behavior. ...In the end, these are wild animals and people should know better. Let's stop looking for excuses in the details and call these people out on their behavior. I do, when I am in uniform or not. Sensible behavior seems to be something that many visitors leave at the entrance gate. They park in the middle of a busy road. They drive the wrong way. They throw trash out the window, leave dirty diapers on the side of the road. They pass on blind corners. They swim in water near a deadly waterfall. They can't follow a simple map or directions. They think they can pet wild animals. They, the humans, are out of their natural habitat. They're in a new situation where they don't know the rules or the dangers. They're overwhelmed. We can't hire enough rangers to follow everyone around. Adults just have to act like adults, think, and take responsibility for their own actions. They shouldn't need a sign to tell them not to feed the animals... but they do. I yelled out my car window once while driving by a family approaching deer in a meadow. "Get away!" I don't know if they listened, but I did my good deed for the day. The trick is to scare the deer away. They listen better than the humans. I was wrong.... there are three of those signs. One at the El Cap Crossover/El Cap Straight intersection, one a hundred feet or so west of that, and one at the west end of El Cap Straight. All on the El Cap side of the road. But for the desire of accuracy, aren't those signs Inaccurate? Yet the young boy wasn't killed near El Cap Meadow but many miles away in Wawona. 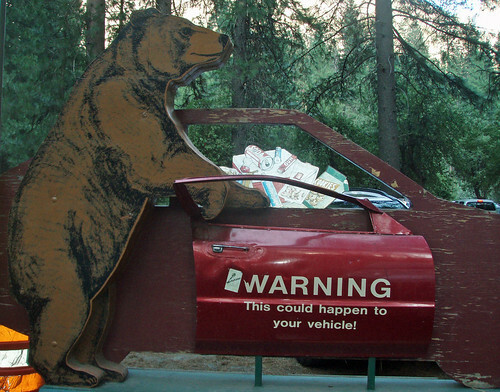 I think the Park Service is being a bit disingenuous with those inaccurate signs. It is a little bit inaccurate, I agree. And odd that they are all so close to El Cap, why not spread around the valley? A guess, but I suspect they put it where feeding happens the most. Of course, it happens everywhere - I was stuck in a deer jam near the junction of 120 and 140 trying to get out of the park, where a guy was standing in the middle of the road hand feeding a buck. We honked but the deer don't startle easy. To complain about the Park being "disingenuous" with this sign is a bit over the top. They probably made a bunch of them and distributed them about the Park. Since these three are in an area not that well visited (all the visitors stay on the other side of the road looking for climbers) they are probably the last three that have not been stolen. I like the Park Service to be truthful with all their dealings and communications with the public. No need to blatantly lie to the public that the death occurred near El Cap Meadow when in fact it occurred many miles away. As I already posted, they could have posted more generic signs informing the public about the death of a 5-year-old that was killed by a deer. No need to lie at all. Personally I would read "near here" as applying to anywhere in Yosemite, or the entire Sierras for that matter. The message given, that Mule Deer can be dangerous, is certainly accurate anywhere near Yosemite or near the specific spot where the boy was killed. I knew someone would try to make this argument to justify the accuracy of the signs. But I doubt that most people who read those sign would interpret them as such. 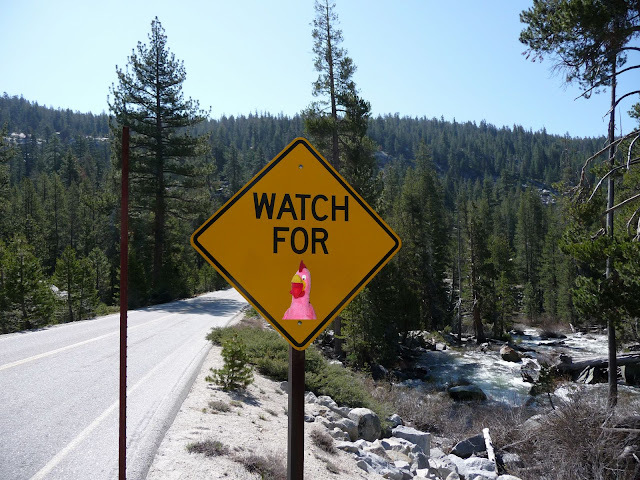 I would guess the vast majority of people who read that sign would think that the fatal accident occurred somewhere in or around El Cap Meadow and not many miles to south. I knew someone would try to make this argument to justify the accuracy of the signs. But I doubt that most people who read those sign would interpret them as such. I would guess the vast majority of people who read that sign would think that the fatal accident occurred somewhere in or around El Cap Meadow and not many miles to south.. The sign is to get people to not feed the deer, not to mark the spot of a death. It's as accurate as it needs to be. They are. No one was lying. That the signs are "lying" is a lie itself. What I expect happened is they made the sign for the Wawona area, then realized it would be good to post it all over. But why it seems to only be near El Cap is a bit odd. I also think it is odd that they only post it at El Cap and Wawona and don't have generic "Don't feed, touch or disturb the wildlife" signs in more places. I have only seen one sign at El Cap and will have to look for the other two. One other question is why they don't have any signs on the south side of the road where more people stand. Maybe Yosemite should do what Yellowstone does. The last time we were there they handed out a placard that on one side said " Stay safe. Thermal areas = thin crust, Boiling water lies beneath DANGEROUS GROUND! Stay on the trail' and on the other side "Buffalo can run 3 times faster than you can! MANY VISITORS HAVE BEEN GORED BY BUFFALO. Do Not approach buffalo STAY SAFE! STAY AWAY! There is even a way to hang it from your rear view mirror so you won't forget. However, I did wonder why they called them buffalo when they are bison. Yosemite could have a wild life warning on one side and on the other warnings about how dangerous going in the water can be. Where I've seen the most people acting stupidly around deer (feeding them, posing for photos next to them, little kids chasing them) inside Yosemite has been in and around the Yosemite Lodge and Curry Village. Seen far more brazenly stupid behavior in regards to being too near to deers there than elsewhere in the park. Many years ago, before I was educated about the dangers of deer, I let my step daughters feed the deer who came right up to our patio at the Lodge. They really need to hand out a warning like the one mentioned for Yellowstone! Most likely they were stolen. Should we put up a sign saying; "CAUTION Tree" so that people will not walk into them? How many signs do we have to put up? I undestand what you are trying to say, but I don't want a park full of signs. With all the roads, bridges, buildings, etc, we have enough visual intrustion. They're not that effective anyway. I often eat lunch at the Village Grill. There must be a hundred signs telling visitors not to feed the squirrles. I see visitors feed them all the time. Then there is that sign warning of death at the top of Nevada Falls that some people climbed right over - and died. We need smarter visitors, not more signs. That's not likely to happen though. You can't protect people from their own stupidity. Edited 1 time(s). Last edit at 10/22/2012 02:34PM by Dave. You seemed to miss the point I was making. You can't put up signs about every danger and you don't want parks to be filled with signs that most people ignore anyway. I agree with not having a lot of signs put up in the park and that is why I brought up what Yellowstone does. It is a way for the rangers to reinforce things when people come into the entrance. It was handed to us separate from the other park information and when it was handed to us, the ranger made a comment about how these were two of the most common mistakes that people make. This may be more effective than expecting people to read what is in the park guide you are given. We have also been given a large sticker upon entry to Arches about not stepping on the biocryptic soil but I can't find it right now and I can't remember exactly what it said. That year there was a big campaign to get people to understand not to walk on it, hence the sticker. We even saw people walking around wearing it. Anyone who has been to Yellowstone knows there are a lot more bison roaming around and in mass quantities compared to the deer in Yosemite. I expect that is why they hand out a flyer and Yosemite does not. I could find a census for Yellowstone bison but nothing on the number of deer in Yosemite. The bison population in Yellowstone fluctuates from 2300 to 4500 animals and according to the 2011 census there was 3,700 that year. Does anyone know how many deer are in Yosemite? In April there was a thread about how many deer live in CA but nothing about how many in Yosemite. I am not debating anything but just curious. I can't give a number but there are a lot of them. And one is far more likely to come in close contact with deer in developed areas of Yosemite Valley (Curry Village, Yosemite Village and Yosemite Lodge and the valley campgrounds) than within the developed areas of Yellowstone. No bison ever wandered up to me while I stayed in Grant Village inside Yellowstone. In Yellowstone, what animal causes traffic jams could be more a function of animal behavior than numbers of that animal. I found the following numbers that do fluctuate yearly and seasonally. In Yellowstone there are approximately 15,000-25,000 elk, 600-800 moose, 2,500 mule deer, 250 bighorn sheep, 3,700 bison. On my Yellowstone trips, I have never had to wait for any deer or pronghorn to move off the road because they tend to bound across them. We have never had to stop for elk because they also moved quickly. I have had to wait while moose, bighorn sheep and bison crossed a road. The moose were in no hurry to get out of the road, in fact, unless they had been spooked or are charging, I have never seen a moose be in a big hurry to go anywhere. On two occasions, we had to wait until a herd of bighorn sheep crossed the road north of the Mammoth Hot Springs area. They were also not in a big hurry to cross, especially the male that waited in the center of the road until the females and young crossed. We only saw them start to run when some people got too close to them. The bison in Yellowstone move in bigger herds than the other animals which adds to the length of traffic jams. Their normal gait is to amble as they go along so they take their time crossing any road. Also, in Yellowstone, bison tend to travel traditional routes that correspond to where the roads now are. There is one section of the road north of the Lower Geyser Basin where the road is sandwiched between the Firehole River and a steep hill. At the same time every morning and evening a herd of bison would come down a slope just before the narrow area and then would slowly proceed down the road taking their good old time. It is so narrow there that you can't drive around them so you just had to wait until they got to an area where they went up where there was another break in the hill. After the second day, we got tired of the wait ( just how may bison pictures can you take in the same spot) so we would not go through that area during those time periods. I have several bison stories but one of my favorite ones is when we decided to cook dinner at scenic stop that overlooked Lamar Valley. We set up our stove and was cooking when a herd of bison started up the hill. When they came to the parking area the herd split into two groups so they could get around the cars that were parked there and for a while we were in the middle of a herd of bison. We just sat on the ground and watched them go by. That stop also was the first time we saw a pack of wolves. There were several researchers there with spotting scopes that they let us look through so we got a closer look. One purchase that we made before our next park trip was to buy a spotting scope. We have never had to stop for elk because they also moved quickly. I've had to stop of elk a few times. Even though they more fast at times the numbers of them can be a problem. I guess it is a matter of time and place. We have never encountered a large amount of elk trying to cross a road, only a few, so all we had to do is slow down enough to let them pass. We have also not seen as many elk in Yellowstone as we do in the Tetons. Even there we have never seen them in a large group because of the time of the year we tend to go, which is when the elk are in the higher country around the Tetons. I wonder what it is like in the fall when they start to migrate towards Jackson. I'll never forget my first visit to Yellowstone with my family (two young boys). We were entering Yellowstone from the Northeast Entrance after a great drive from Chicago. We were anxious to look for wildlife in Lamar Valley and I always had kept the boys interested with "bounty" money. The first one to see a deer, elk, buffalo, wolf, bear, etc. would receive souvenir money. Harder to spot animals would be worth more. Well we entered Yellowstone and at some point we came across a lone buffalo out in the middle of a field. We were so excited, got out to take pictures, even did a family video. After half-a-hour viewing the lone buffalo we piled back into the car. About 5 minutes later, we rounded a corner and lo and behold, there seemed to be a thousand buffalo out in the field. I still remember my boys' reactions and how funny it was we spent all that time on one buffalo. That same afternoon, at Mammoth Hot Springs, I sat on the hood of my car in the parking lot watching the elk in the middle of the meadow-- I think across from the cafeteria or one of the other buildings. Suddenly, one of the male elk made a mock charge. I've never jumped so high and quickly got behind my car, and the elk wandered off. Obviously I was too close (I don't really remember how close) but at the time it seemed reasonable that I was in the parking lot and did not intrude into the meadow at all. I suppose everyone could define danger differently but I would take my chances with Yosemite anytime over the dangers of Yellowstone. Buffalo, wolves, grizzly bears, and even the elk I would say pose much more danger than any of the animals in Yosemite. No, the problem is not dumb people. 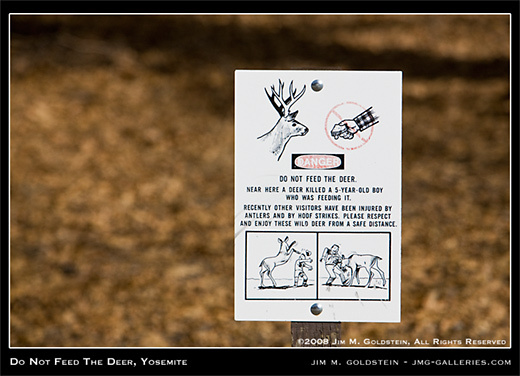 It's that the deer in Yosemite are too smart, and are peeved by the "don't feed the deer" signs. Listen to this lady on a call-in talk show in my native North Dakota, explaining how to fix the problem of cars hitting deer. The call is legit, not a hoax....the press interviewed her later. Apparently, in some cases, the deer are smarter than people. Deer can read. I didn't know that. It goes far beyond that. Not only can they read but will in fact travel up and down the various interstate freeways looking for a sign, sometimes traveling along the shoulder 40 to 50 miles before finding one. I wonder when they'll get to the point of charging tourists for posing with them. Edited 1 time(s). Last edit at 10/23/2012 08:10PM by ttilley. What would the deer do with the money? They have no pockets to put it in. Every doe wants a good buck. Not even a buck or two? These are very intelligent, and patient, animals. I wonder where the school is they all go to to learn about these signs? I wonder if they talk about those "deer whistles" people put on their cars. Who tells the deer that they need to move when they hear those whistles? That is IF they hear them. Usually they are at a high pitch that we cannot hear - and neither can the deer. They may be smarter than some humans, but they hear the same frequencies we do. These are very intelligent, and patient, animals. I wonder where the school is they all go to to learn about these signs? They don't need to go to any school, since they're homeschooled from day one. They don't need to go to any school, since they're homeschooled from day one. .
Edited 1 time(s). Last edit at 10/24/2012 09:09AM by Dave.